Englund Gambit d6 and f6 lines - Chess Gambits- Harking back to the 19th century! Following 1.d4 e5 2.dxe5, Black can try to open lines up immediately with 2...d6, 2...f6, or 2...Nc6 intending a subsequent ...f7-f6. The aim is to get partial compensation for a pawn and practical chances, striving for a quick attack on the white king. This approach can work well in practice, especially at fast time limits, but on the other hand, with accurate play White should be able to secure a large plus. The idea of this line is that after 3.exd6 Bxd6 Black gets a slight lead in development and open lines. 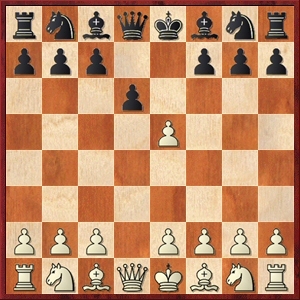 A common plan is to castle on the opposite side of the board to White, encouraging an attacking race, and argue that due to the open lines and development, Black's attack should be slightly faster than White's. Although White is objectively better after 3.exd6, Black's score in practice is pretty good. More tricky for Black to deal with is 3.Nf3, since if 3...dxe5?! 4.Qxd8+ Kxd8 5.Nxe5 White keeps the extra pawn. Black generally continues with 3...Bg4, envisaging a pin on the f3-knight after White's e4-pawn moves. 4.Bg5 then disrupts Black's natural development plans, e.g. 4...Qd7 5.exd6 Bxd6 6.Nc3 and Black will find it difficult to castle queenside with White's g5-bishop pointing at d8. But perhaps best of all for White is 4.e4, transposing to a dubious line of the Philidor Defence (1.e4 e5 2.Nf3 d6 3.d4 Bg4 4.dxe5). After 4...Nd7 (4...Bxf3 5.Qxf3 is very good for White) 5.exd6 Bxd6 6.Nc3, I don't think much of Black's compensation. This is a reversed Blackmar-Diemer Gambit with a tempo less, but nonetheless Black does tend to get about half a pawn's worth of compensation if White takes on f6, and in rapid games Black's attacking chances are quite dangerous. If 4.exf6 Nxf6 5.Bg5 (recommended by Gary Lane) then Black gets some attacking chances after 5...h6, and if 5.Bf4 Bd6. The main problem for Black is rather 4.e4, returning the pawn in order to get a development advantage and good chances of taking advantage of Black's weakened kingside. Following 4...fxe5 5.Bc4, White can then follow up with Nf3-g5, tying Black up to the defence of f7. A related idea is the Felbecker Gambit, 3...Bc5, whereupon White's best continuation is probably 4.Nc3, with the idea of following up with Nc3-e4 in most cases, and meeting ...f7-f6 with e2-e4. If 4.e4 then Black can change plans with 4...Nge7 and have just a modest disadvantage. 3.Nf3 appears to be White's strongest move in the position, but White can also consider transposing into a line of the Nimzowitsch Defence with 3.e4 (1.e4 Nc6 2.d4 e5 3.dxe5). 3.f4 should be met by 3...d6, rather than 3...f6 which is met by 4.Nf3, and Black gets enough compensation for a pawn. 3.Bf4 is the other challenging option, which can be met by 3...f6, 3...Qe7 or 3...Nge7, but Black also has the independent line 3...g5 followed by 4...Bg7, rounding up the pawn on e5, which leads to just a modest advantage for White.